Hello again! 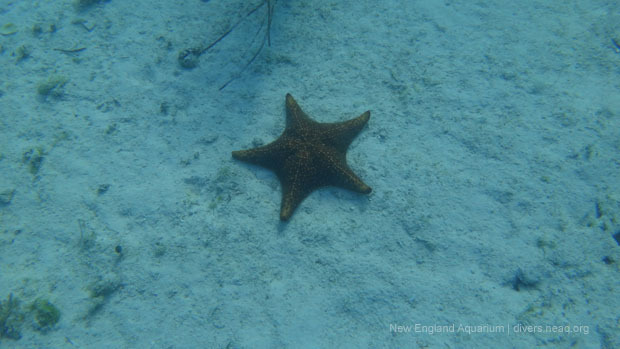 Today will be our fifth day of diving here in the Bimini Islands. When we woke up this morning we were a little disappointed to see that it was pretty windy out and the water was really choppy. Luckily a little cold weather wasn't enough to stop our awesome team of divers from going out and collecting fish for the Giant Ocean Tank! 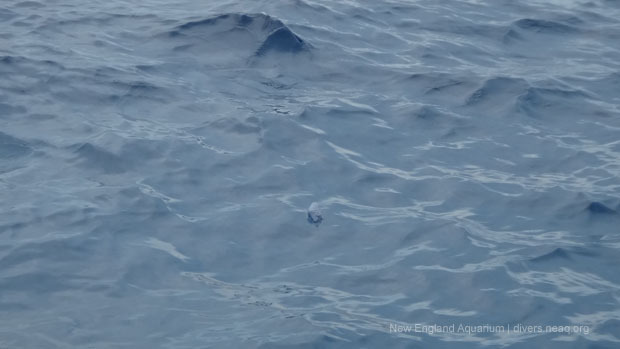 Though the visibility wasn't going to be great no matter where we went this morning, we decided that the conditions would be best back in the area of Frank and Johns (the same site we dove yesterday). When we first jumped in there was somewhat of a surface current, but as we descended down to about 40 feet of water, the conditions were perfect for catching some fish. 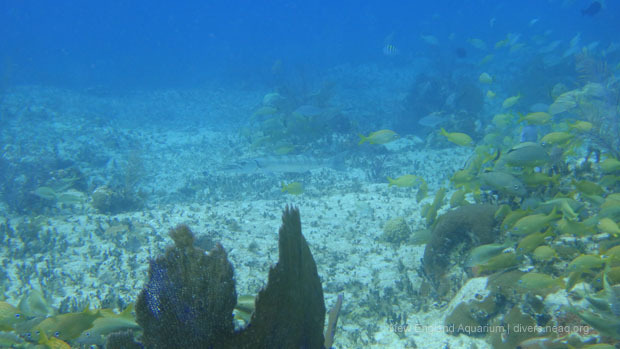 On our first dive, we saw two really cool large hogfish! On our second dive that we decided to do at Frank and John's, we saw a large great barracuda and collected a lot of little chromis fish! Our third and final dive of today was a new one for me. 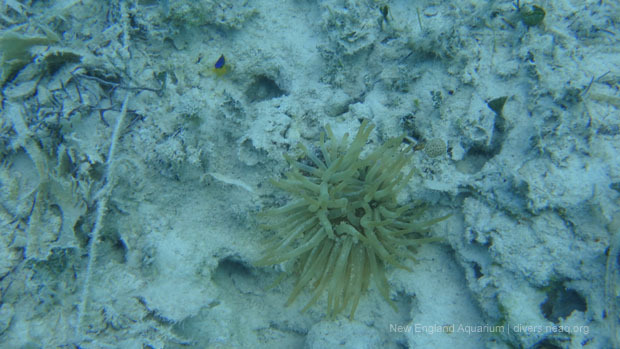 We decided to take the R/V Coral Reef II over to an area called Dollar Harbor. It was here that we did a drift dive. Basically a drift dive is a dive where you go with a group of divers and there is no need to navigate. One of the divers holds a reel attached to a dive flag, and you just drift along in the current. The captain of the boat gave us all a time (40 minutes) for when we needed to surface. 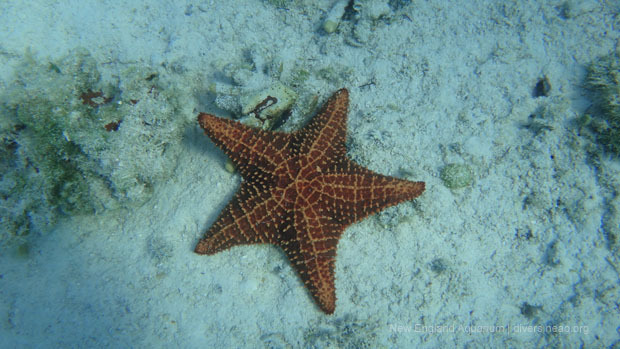 We would surface wherever we were and the captain would meet us on a little Zodiac boat. 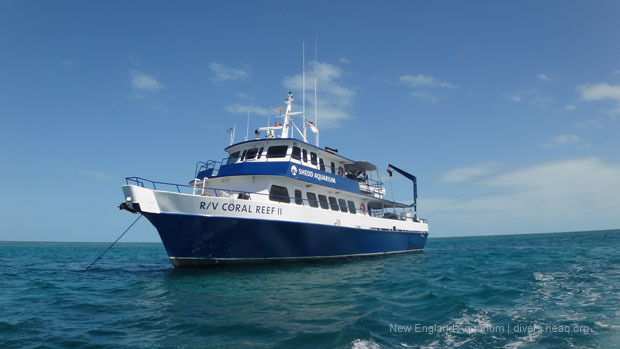 We would then take off all of our SCUBA gear in the water, hand it up to the captain, jump into the little boat, then get a ride back to the Coral Reef II. Not needing to navigate made the dive very relaxing, and it was an extremely productive collecting dive. 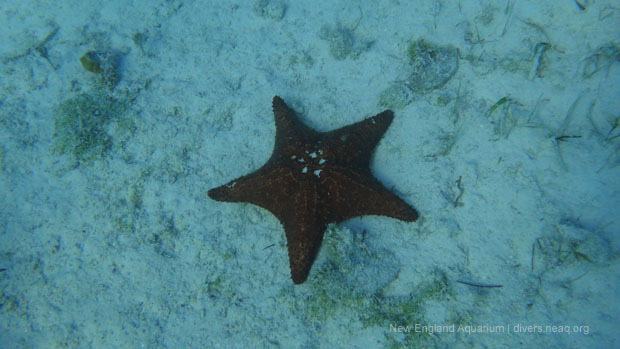 Though we didn't collect any of these guys on this dive, we saw lots of big and colorful sea stars! 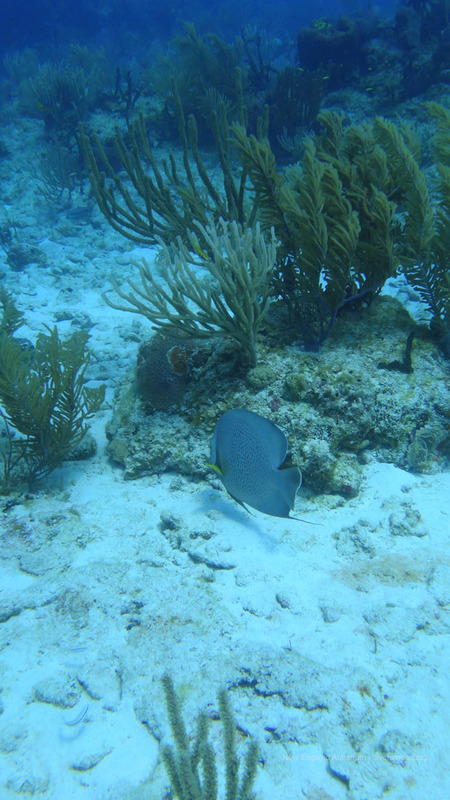 Today was another great day here on the R/V Coral Reef II! We finally woke up to beautiful weather and calm seas. Our day today consisted of four dives at two different dive sites. The first of the two sites was called Frank and John's. 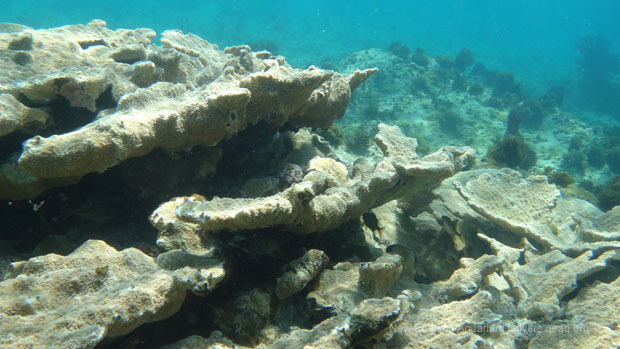 At this site, we collected many fish, but our target was blue chromis. These are beautiful little fish and are always a big hit in the Giant Ocean Tank. 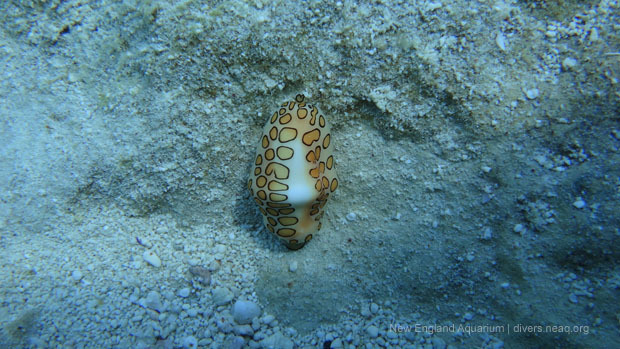 On the first of the two dives at this site, we saw a scrawled filefish and a queen triggerfish! 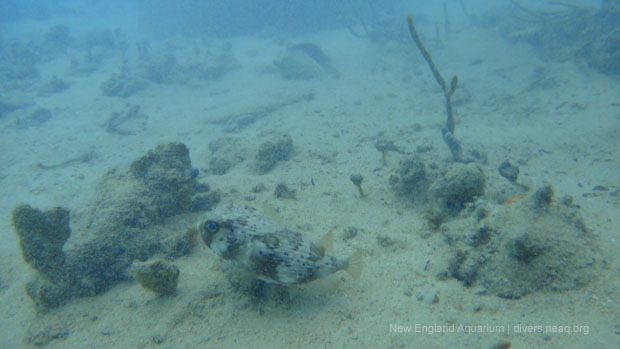 We already have a few beautiful scrawled filefish in the new exhibit who will be eventually moving into the Giant Ocean Tank, and the colorful queen triggerfish was just a little bit too quick for us to collect and take home to Boston. On the second dive at Frank and John's, we saw a unique fish called a highhat. This little guy was a juvenile and probably about half the size of a dollar bill. 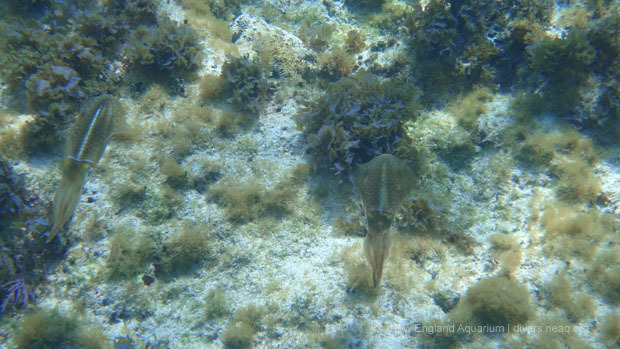 We would have taken this little guy home with us too, but he was smart enough to hide out in some large sea urchins where we couldn't get him (little did he know how lucky he would have been to come home to the G.O.T.)! What is really fascinating about highhats is the way that they change over time. If you look up a picture of an adult highhat and compare it to the juvenile above, you would never even guess it was the same fish! After splashing down at Frank and John's, we decided to make our way over to a new site called Lunkers Head (couldn't tell you where the name came from). 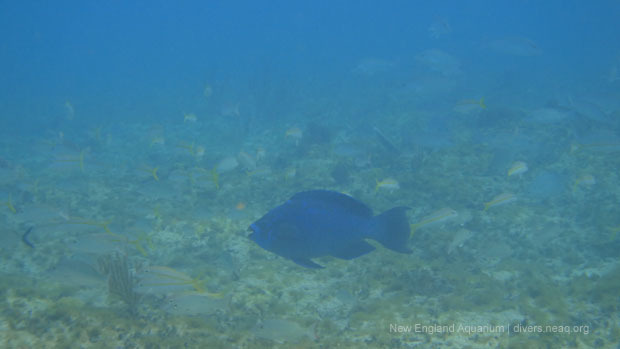 Though the visibility (the distance you can see underwater) wasn't all that great at this site, we didn't mind all that much because we were able to collect a lot more blue chromis! 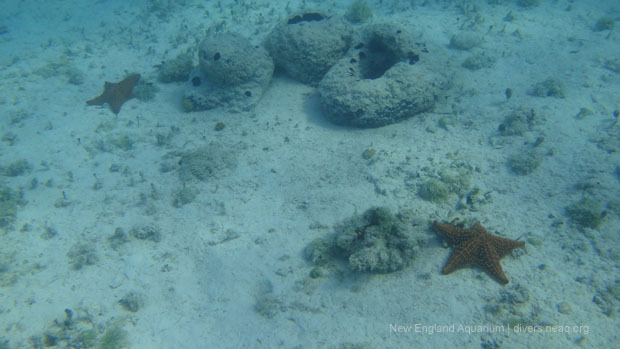 It was also at this site that we were able to finally find and collect some really cool fish called hamlets! 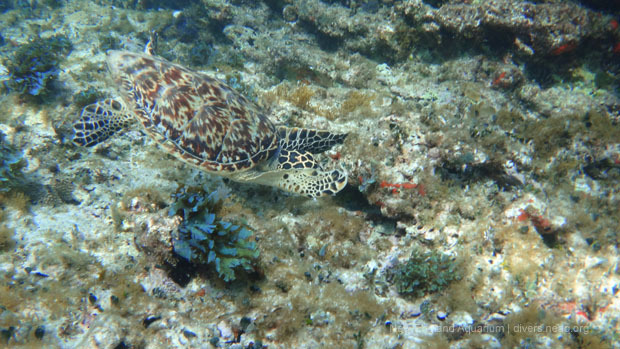 It is difficult to get pictures of the fish we collected, because, well, we are busy collecting them, but it is nice being able to get some great shots of other amazing animals on these sites. In an attempt to collect a hogfish, the chef on board (Chris) and I were unknowingly brought within inches of a large, rather grumpy looking barracuda! 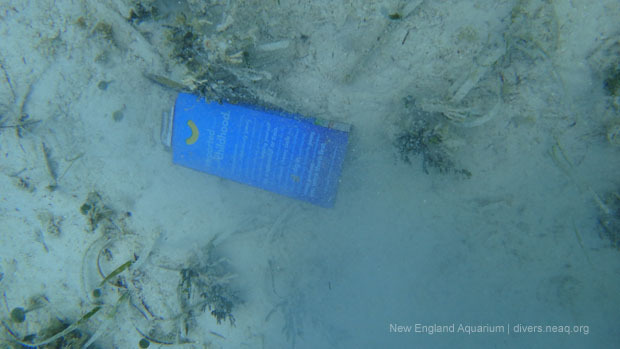 On the second dive at Lunkers Head, we chose to collect at the part of the reef in front of where the boat was anchored. 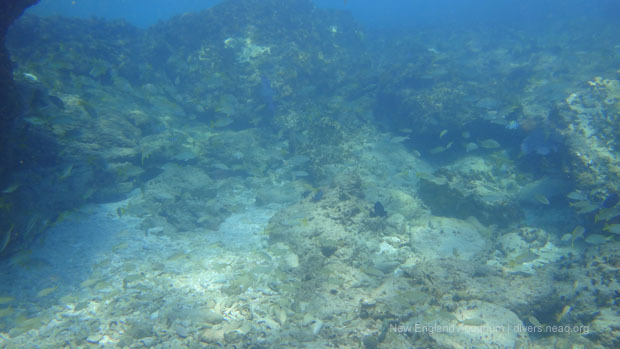 In this area, we saw huge, amazing schools of beautiful Creole wrasse. 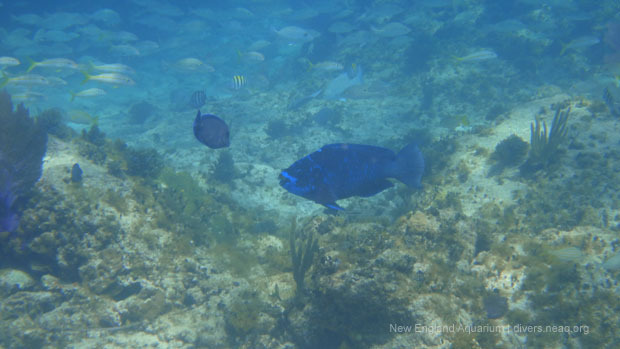 These colorful fish are really gorgeous, and a few of them were already collected for the newly renovated Giant Ocean Tank by the an earlier collecting group to Bimini this year! 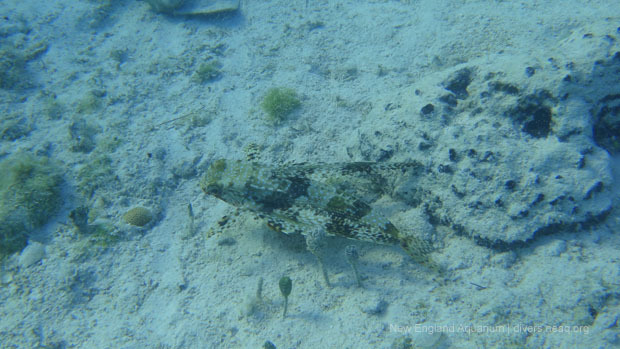 We also happened to see a few random, larger fishes during the dive on this site as well. 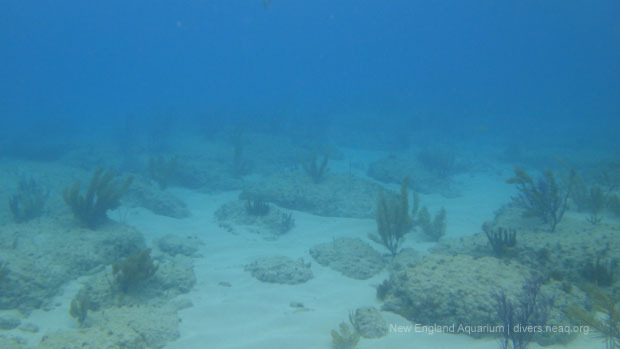 Tomorrow we will be doing some more diving, as well as a special method of collecting fish called a beach seine. Usually in a beach seine, we attempt to collect needlefish, barracuda, small parrotfish and sometimes different kinds of box fish. The fun and exciting parts of this method of collecting is that there is always a surprise and always something interesting that turns out. Be sure to check back to see what comes up in our nets! About a year and a half ago, this trip's blogger became an intern diver in the Giant Ocean Tank at the New England Aquarium. Luigi loved being at the Aquarium so much that he became a volunteer diver after his internship was over. 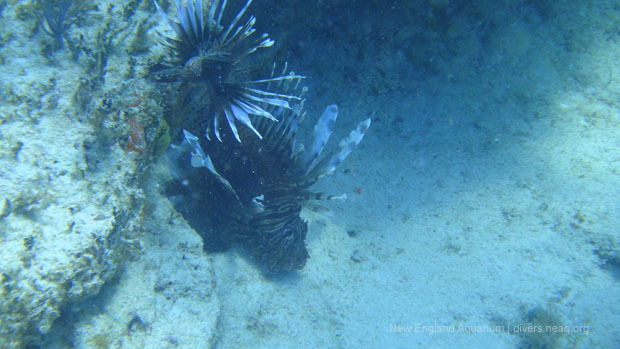 He also joins Aquarium divers to help collect fish, under special permits, so that visitors in Boston can appreciate the splendor of a healthy Caribbean reef. 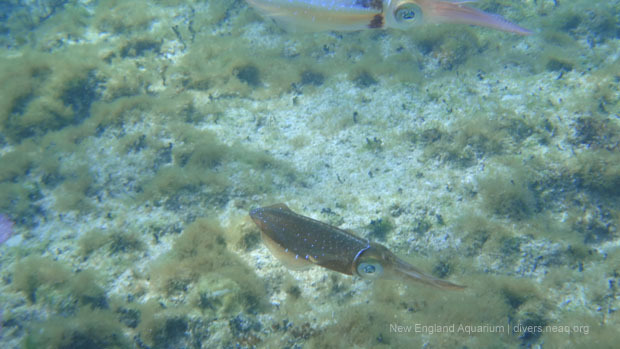 After a top-to-bottom transformation, the Giant Ocean Tank is now teeming with fish like these! The New Aquarium Experience starts July 1. 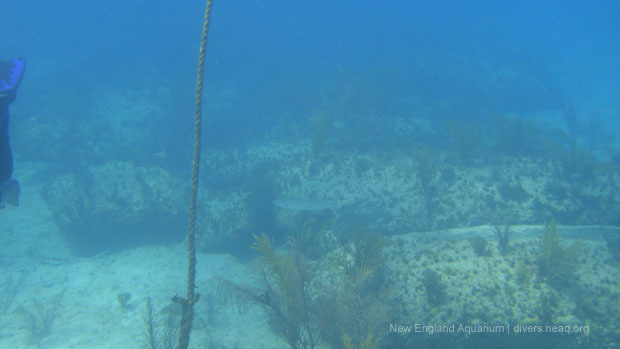 For our third day of fish collecting we decided that we would start off with a wreck dive! 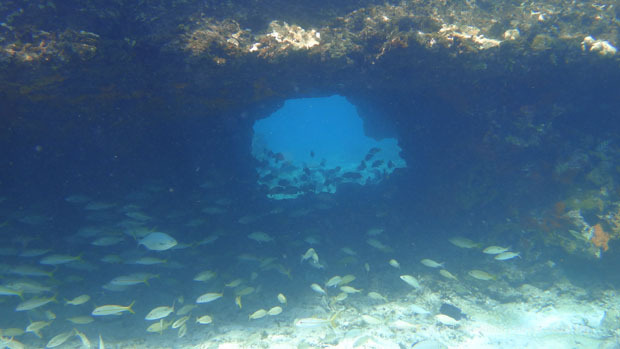 Today we dove the beautiful wreck of the Sapona. 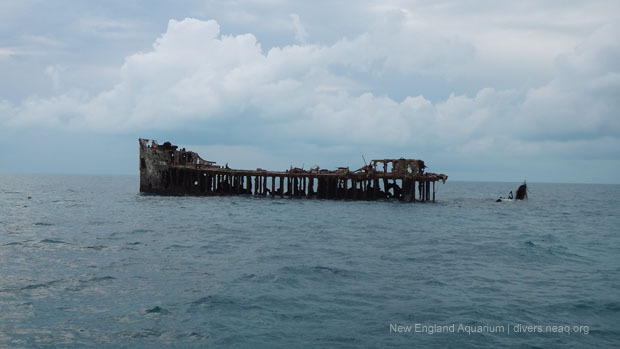 If you Google the wreck, you can learn all about it's very interesting history. 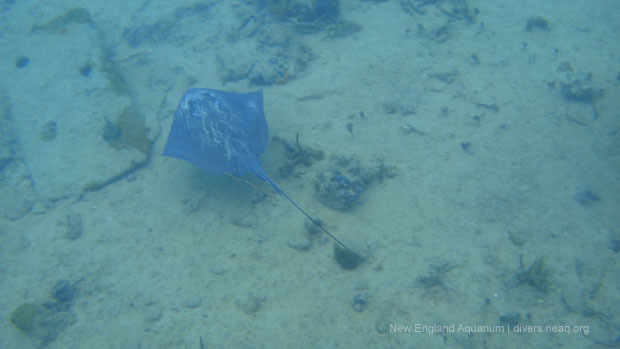 and even two Southern stingrays (just like the ones in the Giant Ocean Tank)! 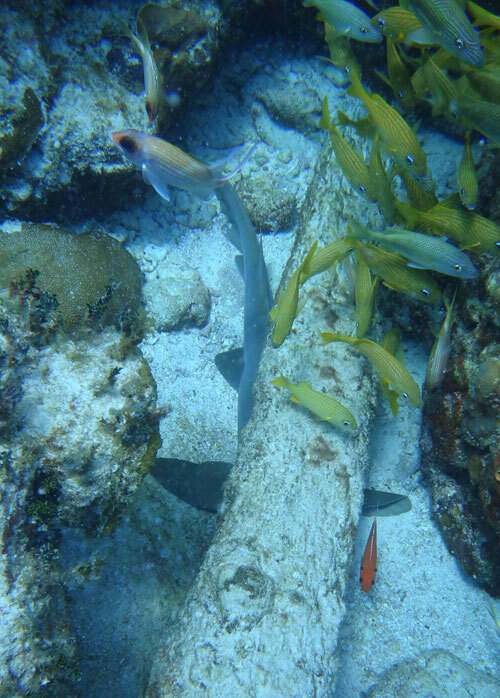 After our dive at the Sapona, we moved on to another dive site called Floyd's. 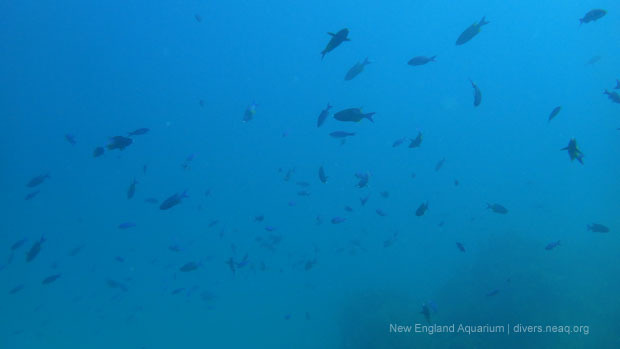 We did two dives on this site and managed to collect quite a few fish while we were there, including some juvenile angelfish who will be lucky enough to grow up happy and healthy in the brand new Giant Ocean Tank! 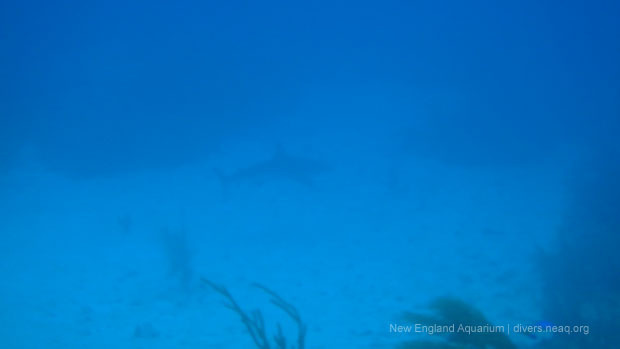 During our first dive at Floyd's, we were very fortunate to see a rather large shark in the distance. 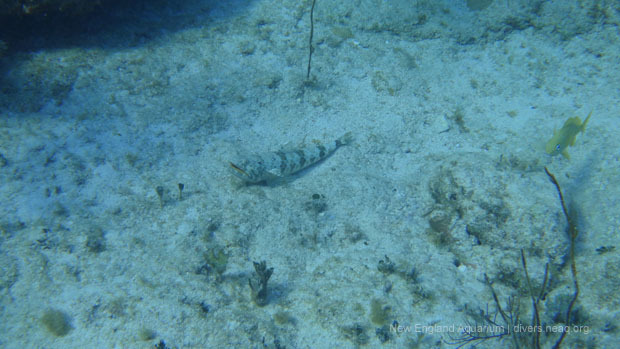 The dive team has a few guesses, but nobody has come up with a positive identification for this animal yet (due to my not-so-great photography abilities). 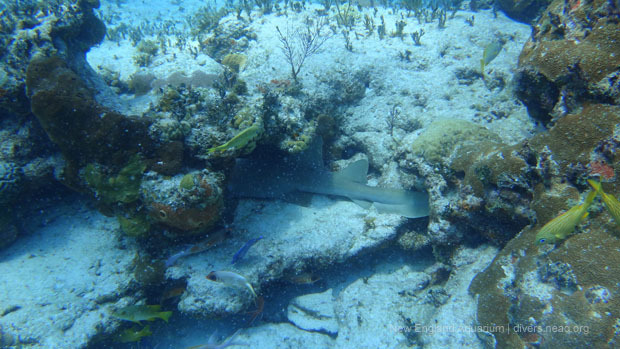 By looking at some of the different features, like the shape of the animal and the sizes of it's different fins, can you guess what kind of shark this is? Right as we were about to jump into our second dive at this same site, we had already seen an animal at the surface behind the boat! It was a Portuguese Man-O-War. 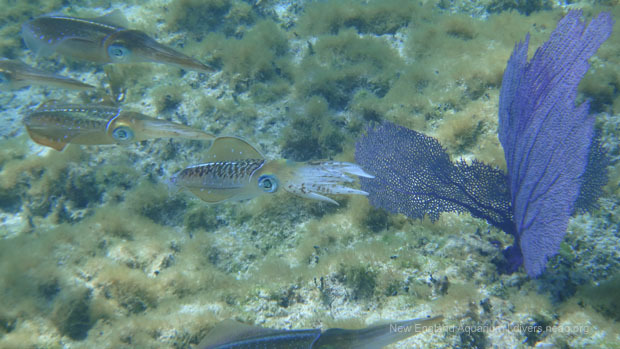 According to Chris, our jelly expert on board, these guys can have stinging tentacles up to five feet long (depending on how much they eat)! Make sure to check back to keep up with all of the exciting new animals we are encountering and collecting, which you can start to see in the Giant Ocean Tank! 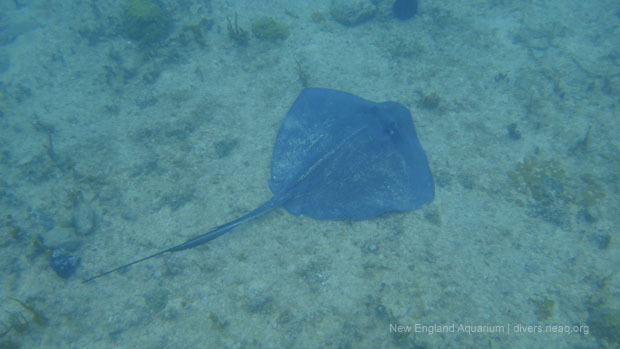 About a year and a half ago, this trip's blogger became an intern diver in the Giant Ocean Tank at the New England Aquarium. Luigi loved being at the Aquarium so much that he became a volunteer diver after his internship was over. 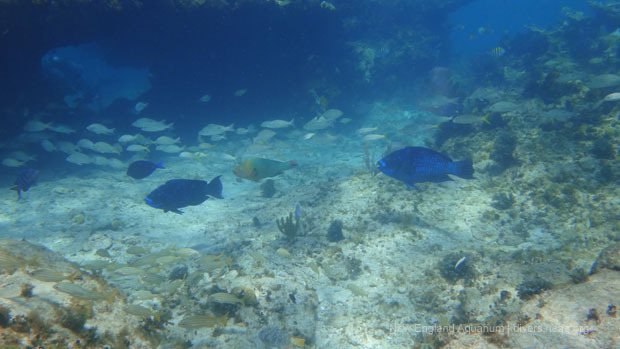 He also joins Aquarium divers to help collect fish, under special permits, so that visitors in Boston can appreciate the splendor of a healthy Caribbean reef. He is also a diehard Boston Bruins fan. Hello again! 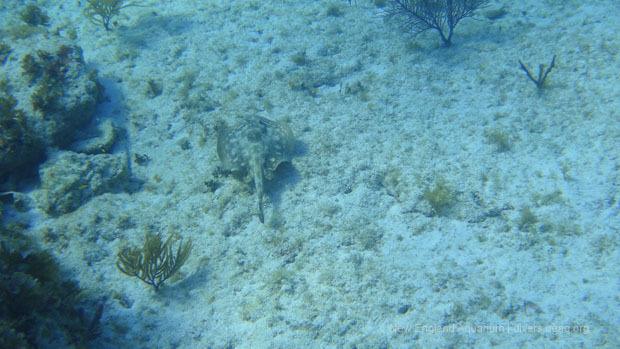 Today was another great day filled with very interesting dives here in the Bahamas! 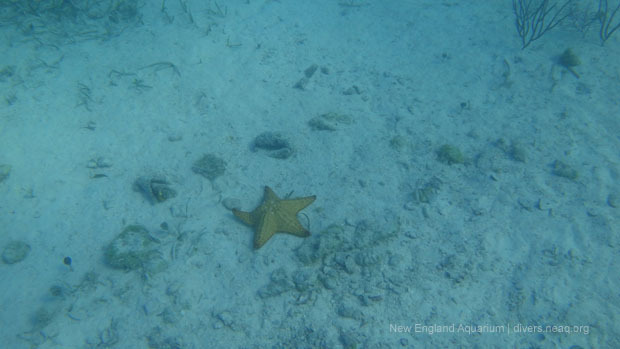 Our dive team conducted four dives today at two different dive sites. 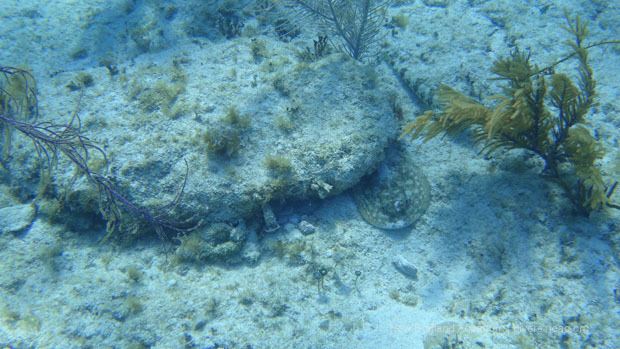 The first two dives were at a site known as Bimini Road. 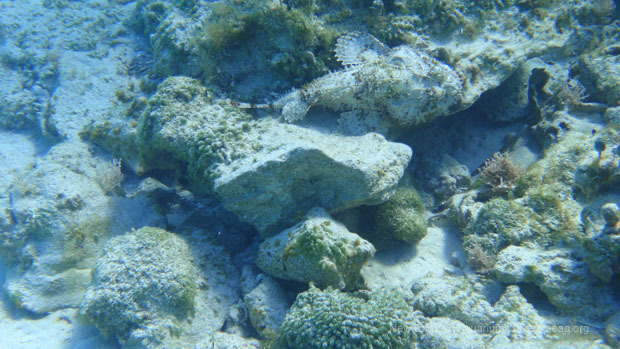 Bimini Road got its name because of the giant slabs of stone at the bottom of this particular plot of ocean. The stones resemble a long underwater road. 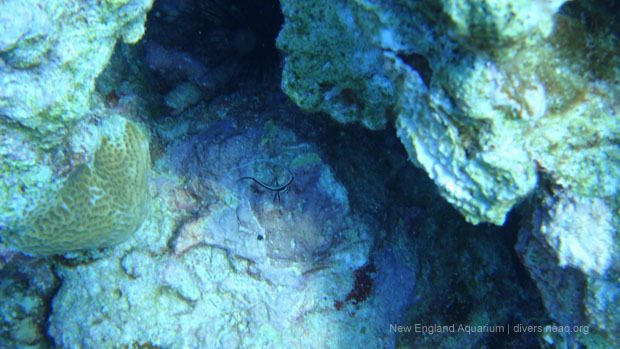 On our first dive at Bimini Road, we collected a lot of fish including a really cool rock beauty. When I was learning my fish ID, I always remembered the name rock beauty by remembering that it is the “beautiful Bruins fish”, and I'm sure you can see why. 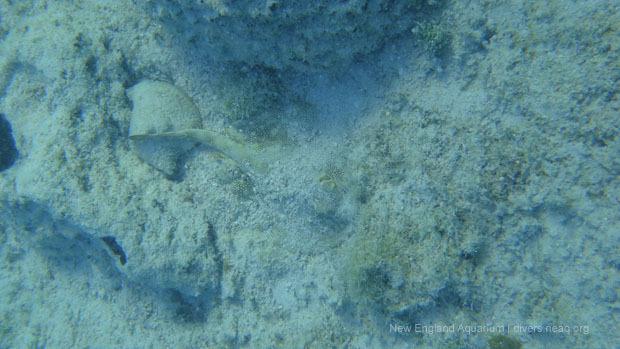 Peekaboo, I see you, yellow ray! 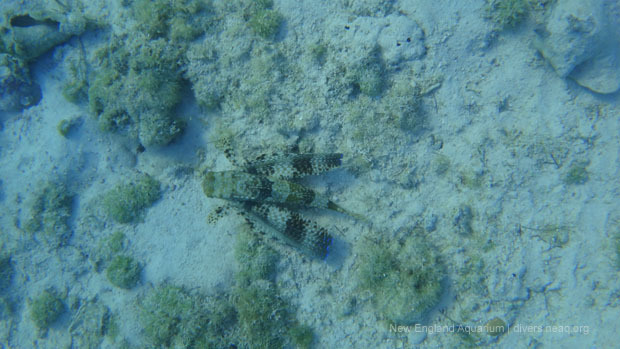 As well as a few awesome bluestriped lizardfish! 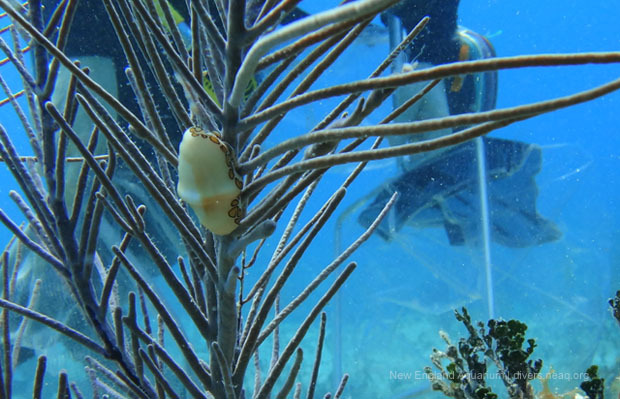 On our second dive at Bimini Road, one of the fish that was collected was a juvenile orange spotted filefish. 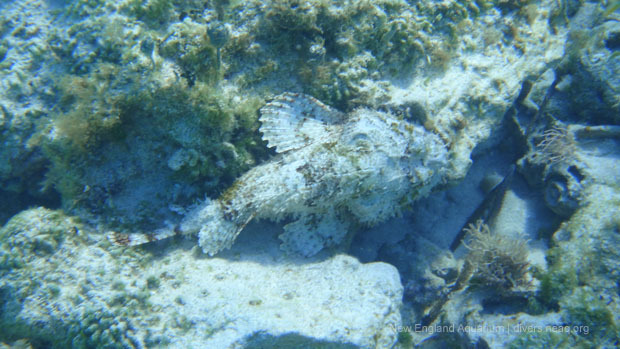 This is a really cool fish with a protective trigger on the top of its head! 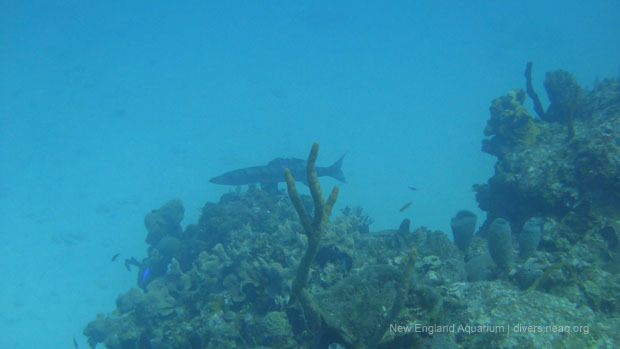 On this same dive, we were also lucky enough to see very large schools of grunts and even a great barracuda! 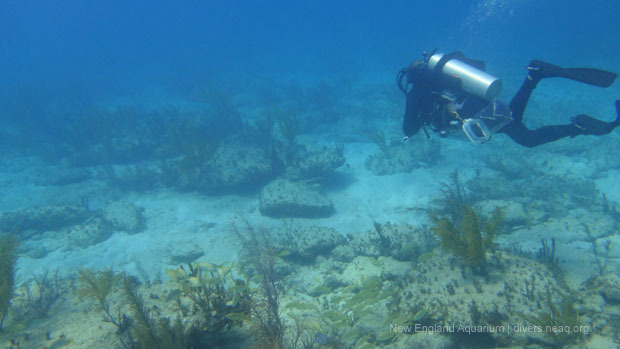 After our two dives at Bimini Road, we decided to move on to another dive site called Three Sisters. 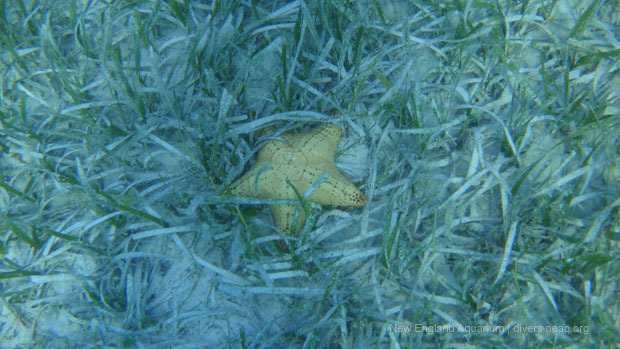 It was at this site that our dive team conducted what is called a grunt roundup. 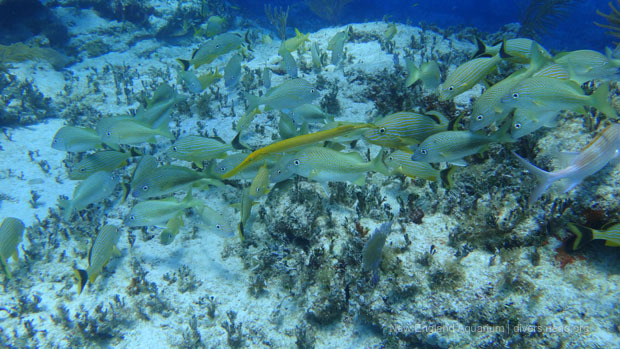 A grunt roundup is a large group effort to collect as many grunts as possible in one dive using special nets and barriers. We collect so many grunts on these dives that we even designed a special underwater device that we call a Grunt Hotel. We use the Grunt Hotel to hold all of the collected grunts and keep them very happy until the dive is over. A few kinds of grunts we are collecting for the reopening of our Giant Ocean Tank on July 1st include French, smallmouth, Caesar, bluestriped and white grunts. These are all beautiful fish who will form a wonderful school when introduced to Boston's largest fish exhibit in July! Unfortunately throughout the day weather conditions deteriorated and the final dive of the day at Three Sisters was made optional. I and a few other divers decided to tough out the bad weather and jump in again, and we were all very glad we did! 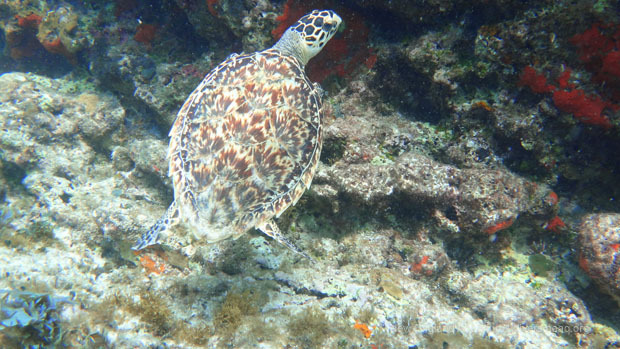 On a relatively short dive, we saw a beautiful hawksbill sea turtle and two very large midnight parrotfish. These beautiful fish were way too big to ship back to Boston, so we did not collect any of them. 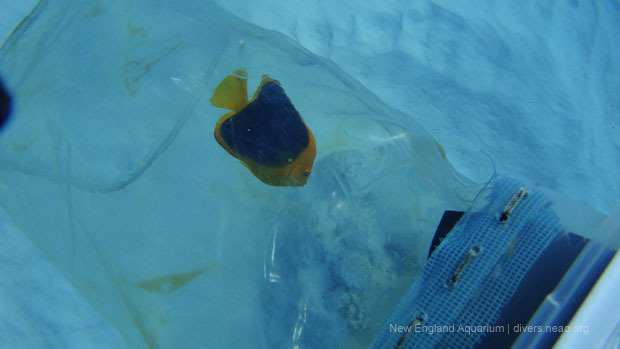 We did however, catch another orange spotted filefish! That's it for today everybody! 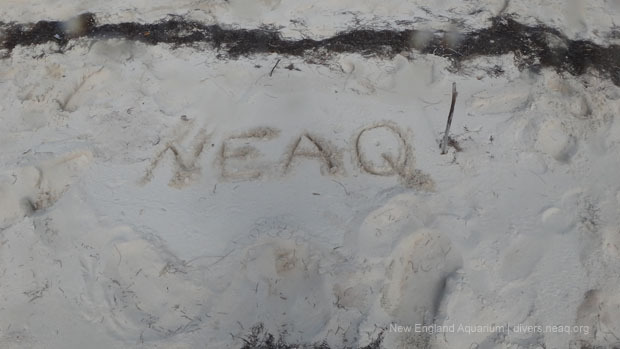 Be sure to check back again soon to continue following our adventure here in the Bimini Islands. About a year and a half ago, this trip's blogger became an intern diver in the Giant Ocean Tank at the New England Aquarium. Luigi loved being at the Aquarium so much that he became a volunteer diver after his internship was over. 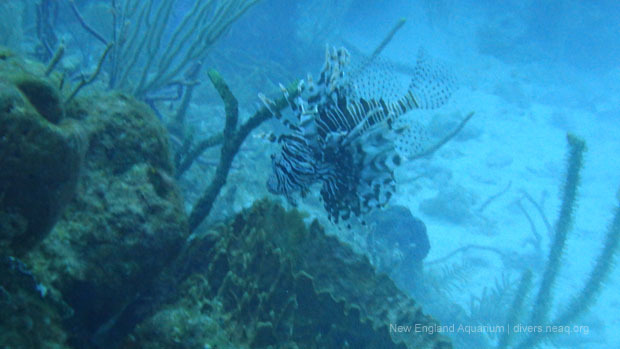 He also joins Aquarium divers to help collect fish, under special permits, so that visitors in Boston can appreciate the splendor of a healthy Caribbean reef. After a top-to-bottom transformation, the Giant Ocean Tank is expected to reopen in early summer! 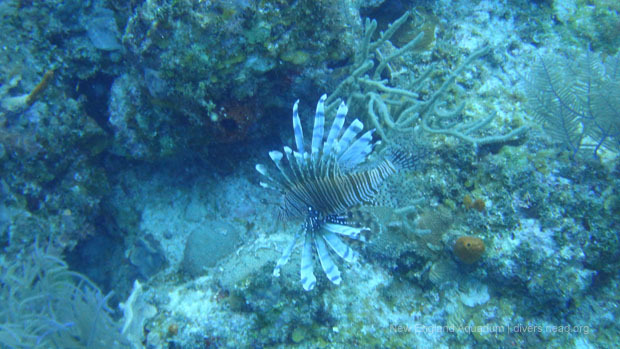 and though it isn't a good thing, we all saw a lot of lionfish. 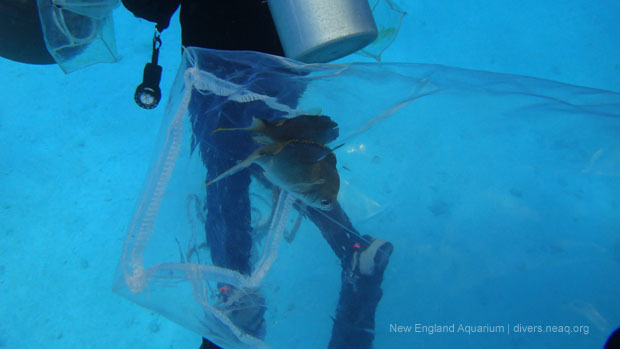 Did you know that the New England Aquarium was the first aquarium to ever successfully breed queen triggerfish? 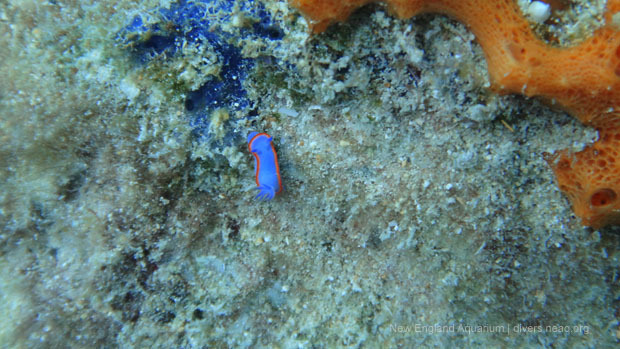 While researchers are studying aquaculture, our team of divers caught one of these beautiful and colorful animals at a dive site called Rainbow Reef so people at home can see them, too. 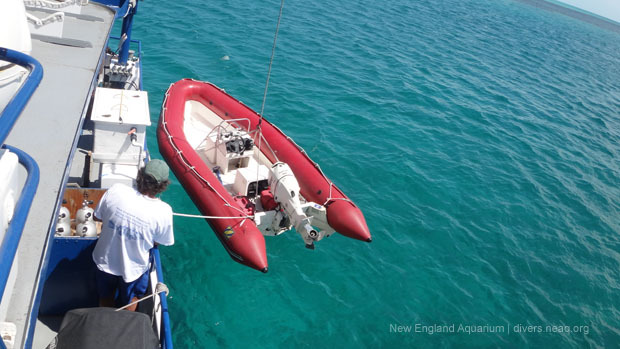 We had a relatively smooth crossing this morning across the Gulf Stream and I look forward to reporting more of our interesting catches and finds as the week progresses!